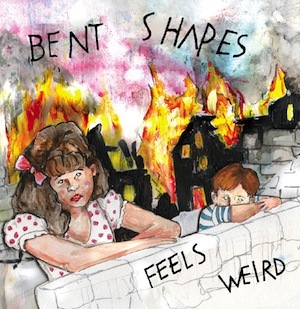 Feels Weird is a blink-and-you’ll-miss-it kind of record. At just 27-minutes, these 11 jangle-pop ditties breeze by without offending anyone or leaving much of an imprint. Perhaps this was intentional, or perhaps not. It doesn’t really matter. Bent Shapes’ debut is still unquestionably engaging — singer Andy Sadoway’s tendency to submerge his snarky cynicism beneath pretty barre chords gives it connotations legs — while at times presenting us with a relatively bare canvas that could so easily have been splattered with a fuller sound. There’s a clear line down the middle here. About half of these tracks pack chutzpah enough for amenable ears, like the Cars-esque “Panel of Experts” or “Big Machine,” a straightahead vamp that cruises through shudders of feedback. The other half aren’t wholly weak, but individual elements sure are; uninteresting guitar leads practically beg for a more compelling replacement. And then there are the wild cards, among them the metal rockabilly shuffle of “Brat Poison” (essentially one big gnash of teeth), that demonstrate the potential for smart, threatening pop that lives inside Bent Shapes.